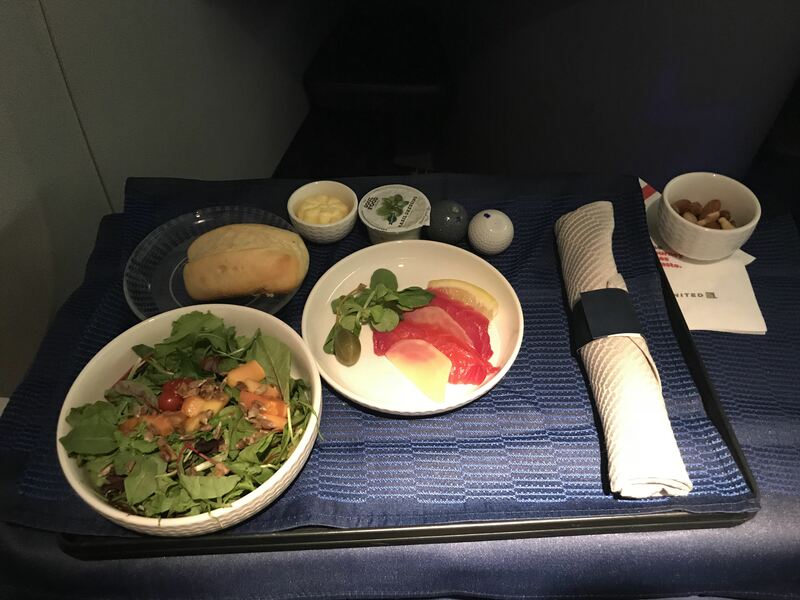 Last week I had the honor to fly United's Polaris Business cabin before it's going to be changed in October with the upcoming merge and new service. 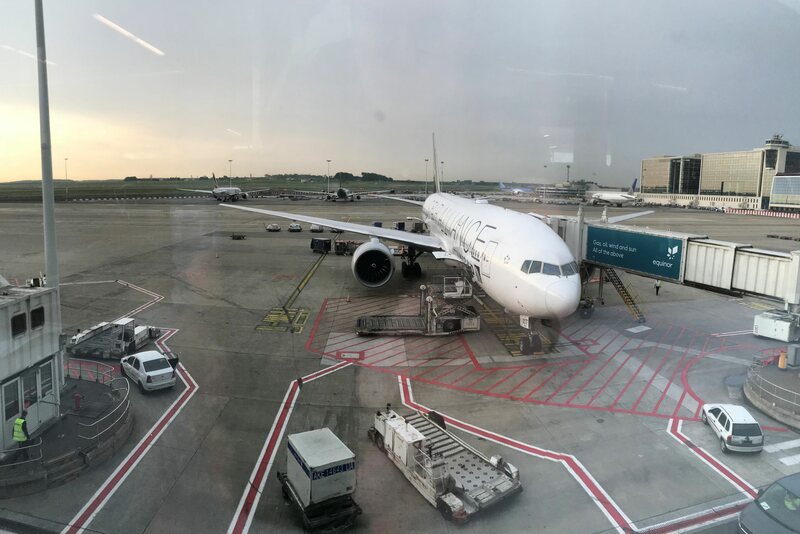 Already since my last travel in March there were some changes, apart from the airplane (764 - 772). Today's load was full in eco but half in Polaris only 24 out of 50 seats were occupied. For this flight I had 11A which is the last row of their Polaris cabin. 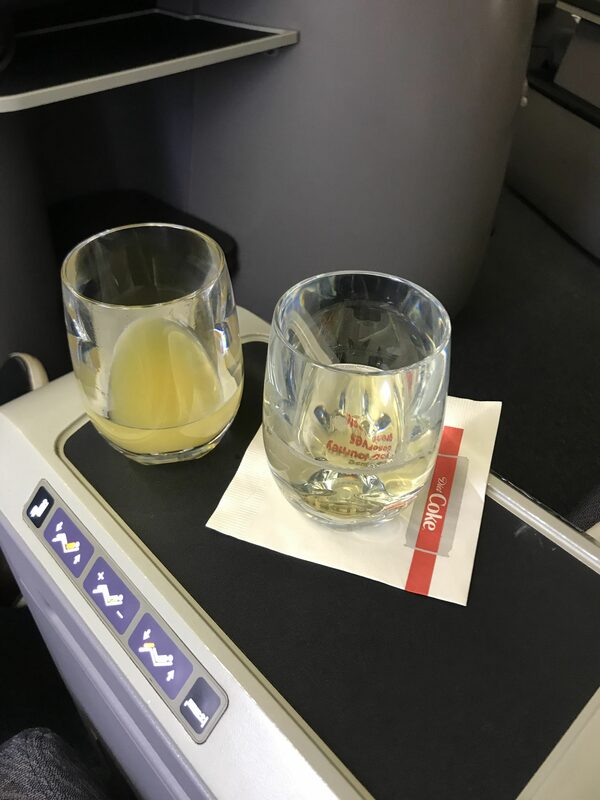 I was greeted by several friendly flight attendants and as soon as I found my seat and put everything away a crew member came over to give me a menu and asked my what I wanted to have as a pre departure drink. Here was already the first difference, big glasses and literally anything you wanted to drink they would serve you from hot to cold drinks. I opted for a Mimosa and got a complimentary champagne + refill all that before we took off. 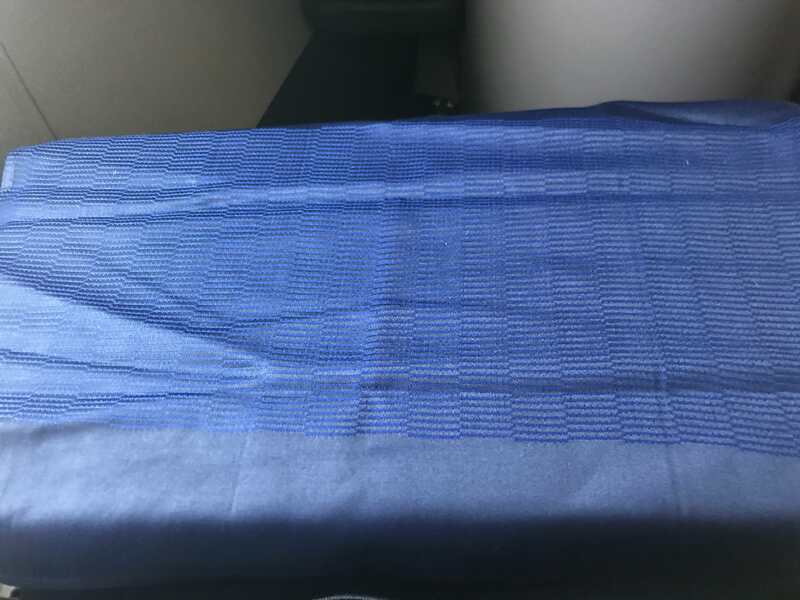 A little while later the same crew member came back and asked if I wanted to have a matras cover for the seat which was unusual for a short international flight as usually they would give those on the ultra long haul flights as from 9hrs. The seat itself was clean and everything what you needed was on it. 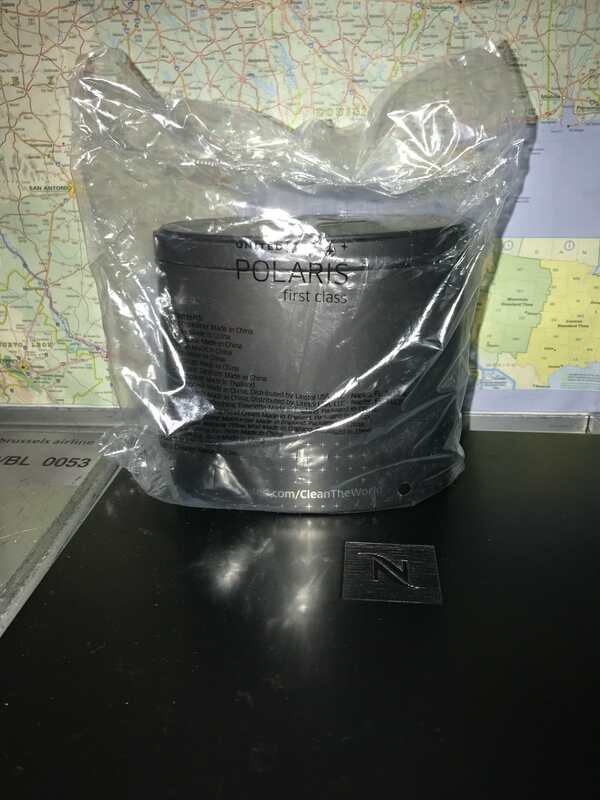 A large pillow and a foam pillow, a light blanket and a duvet as well as the amenity box which was accidentally from Polaris First (which they have on the BRU-ORD/IAD) the contents aren't that different only the branding on the items says Polaris First and you have a small bottle of mouthwash which are replaced by mints in Polaris Business. Near 10.00 ground staff was walking back and forth through the cabin as there was a problem with double seating in economy and a no show passenger who in the end was physically on board. But at 10.05 the door was closed and the plane was pushed for a take off roll from runway 25R. Flight time today would be 7hrs25 so a good jetstream would bring the plane on time to Newark. 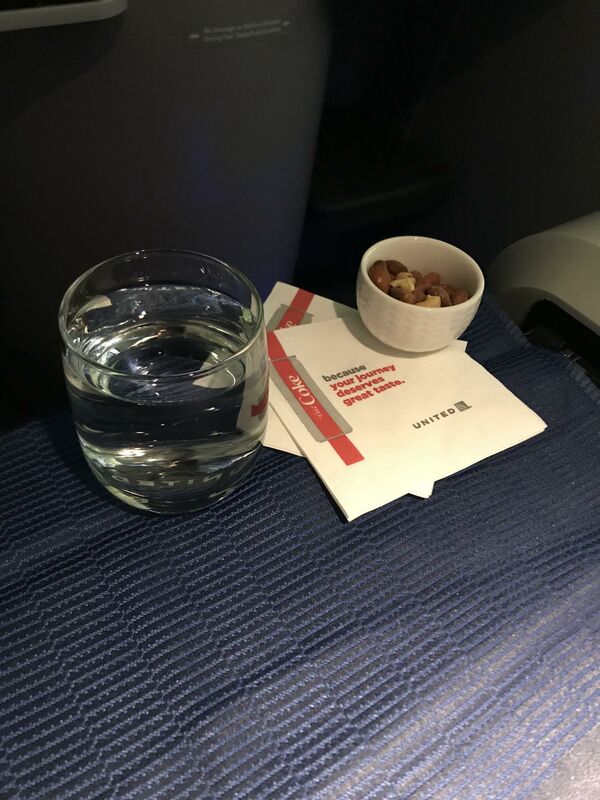 As soon as the FSB sign was switched off the crew started with dressing the tray tables with napkins and bringing the usual warm nuts accompanied with drinks. Here was the 2nd change, they brought a meal cart in the aisle where before it was a by hand service. They did have a huge napkin draped over the cart to hide it with big branding of Polaris (in case you wouldn't know you were in Polaris). Today's service was a bit in a rush as I had the impression the crew wanted to have a quick inflight rest. Usually they let you enjoy your aperitif first before bringing the tray with the starter but this time they brought it straight away. Now you had the choice of bread but the quality of the bread went a bit downhill as I've seen better out of Brussels. Once my starter and salad were finished they cleared the plates and brought the hot dish. My choice was the chicken but it looked like something was missing. 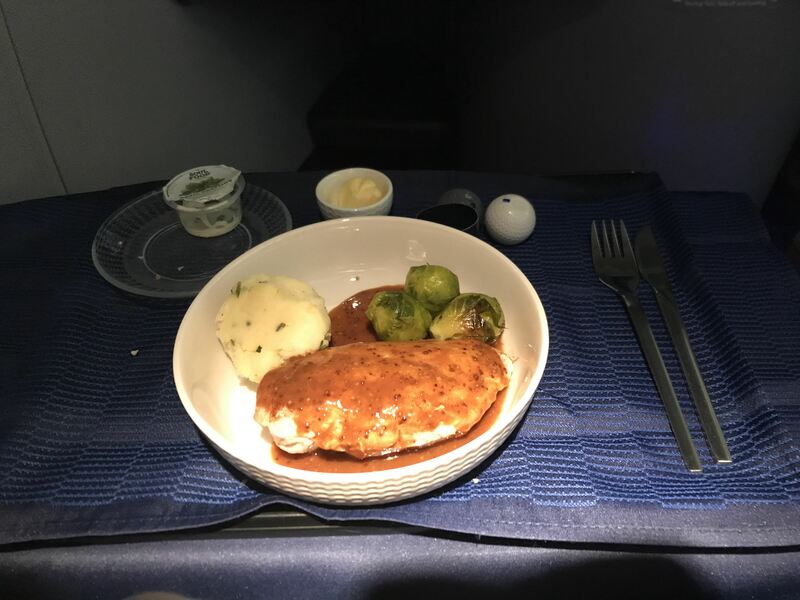 The chicken was really good to be honest but it was not refined, a piece of chicken some mashed potatoes and 3 Brussels sprouts. 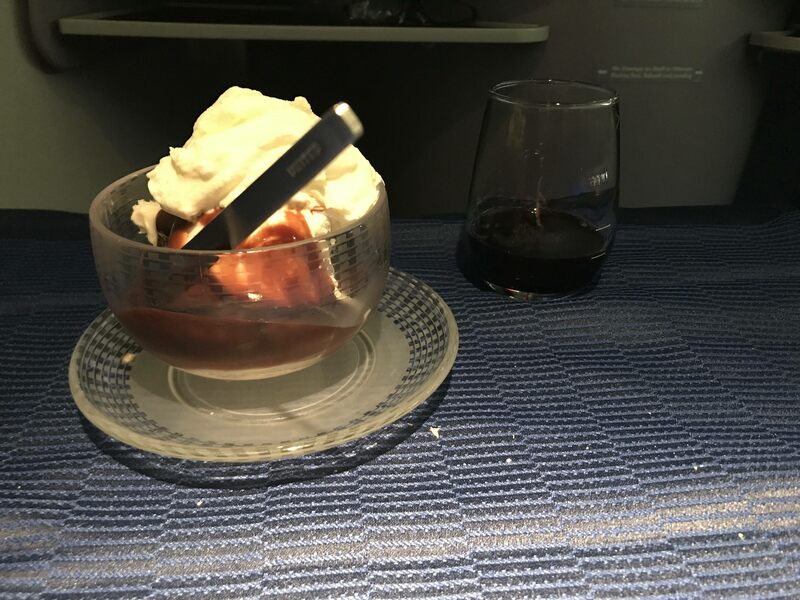 The cheese which came afterwards was a better selection from last time as they changed it a bit and of course the typical sundae which is a classic on United. Once they cleared everything lights were dimmed and no crew was to be seen anymore except in the galleys. Before they took their rest they handed out bottles of water which you could get from the galley if it was finished. 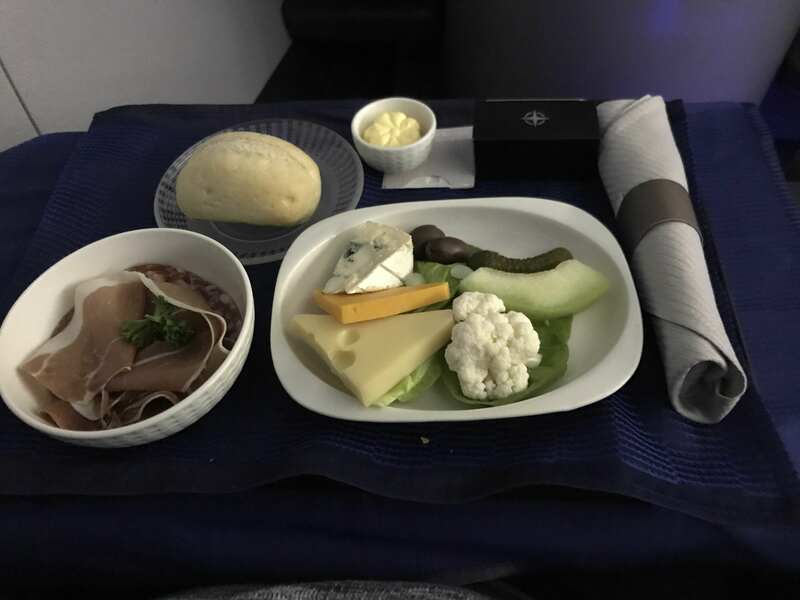 Throughout the flight they have a service cart in between the 2 Polaris cabins with bottles of water, sweet and salty snacks as well as fruit. 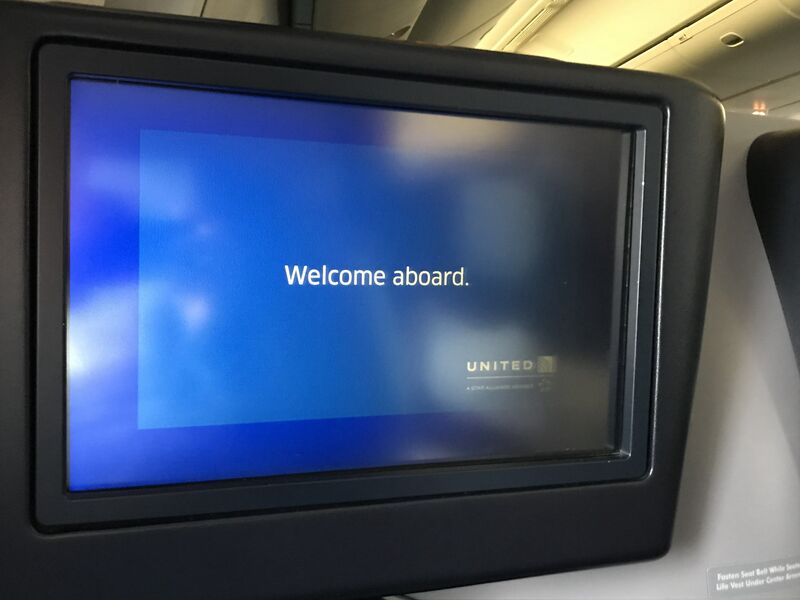 The entertainment system also had a little update but it looked rather simplistic although the movie selection itself was still enough and complete for a 7hr flight with a lot of new and recent movies. They did got rid of the cockpit channel which allowed you to listen to the radio contact. Before the landing there was a light meal service having 3 options, 2 hot ones or just the cold one. I took the cold option as it was rather an in between snack than a light lunch (arriving around noon). Once the service was finished the crew came around with the small box of chocolates which is still a nice touch for an American carrier. The wind was coming a good direction giving a lookout on NYC during the landing at Newark Airport. Sadly the flight arrived at terminal B which has a terrible immigration entry as C goes much faster as that's United's terminal while terminal B has all Star Alliance carriers and other international arrivals. After a good flight this is really a downside on the experience. After all those years I still don't get their system how to process multiple flights in an efficient way. 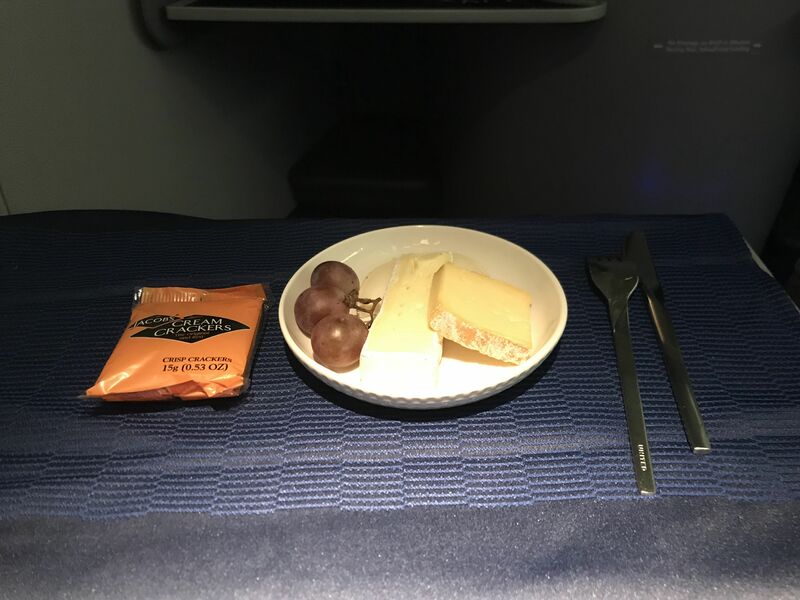 Today's flight I'll give a 7/10 for catering as the food was good but the service was a bit rushed, cabin wise it's a 8/10 as the seats are really comfortable and the bedding makes it even better. The crew get's a 8/10 as they were friendly throughout the flight and available , just a bit rushed though.